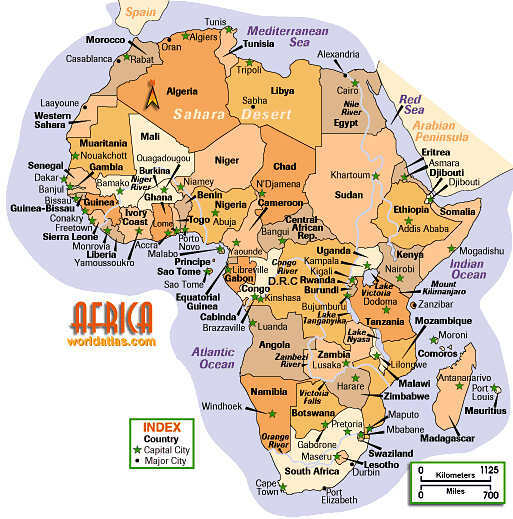 The interactive map of Africa below shows all its countries and their major cities, along with political and geographical features and a lot more. The African continent comprises a vast, rolling plateau, extending from the Atlas Mountains to the Cape of Good Hope. Its history of inhabitation by human beings dating back as far as the earliest known forebears of mankind is evidenced by an abundance of amazing discoveries of fossil remains over the whole continent. Africa's cultural riches really complements its natural beauty. As the number two of the Earth's seven continents as far as size is concerned, It contains more countries than any of the other continents, a total of 52 to be exact. 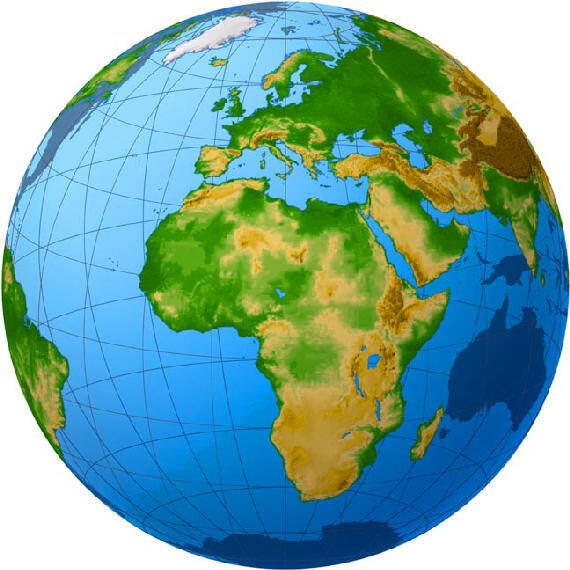 The continent comprises a surface area equal to 22 percent of all the land area worldwide, amounting to a total of 30,330,000 square kilometers (11,699,000 square miles). According to prehistory experts, South America and Africa where split apart by tectonic forces at some stage during the disintegration of the supposed super continent Gondwanaland in the Precambrian period more than 150 million years ago. It is also thought that in more recent times in the Tertiary time period, the same forces caused the Arabian peninsula and the island of Madagascar to split off from Africa, creating the Rift Valley and the East Africa volcanoes Mount Kilimanjaro and Mount Kenya. The interactive potential of this map is rather amazing. Explore any location on the map by placing the pointer of the computer mouse on that particular spot and then follow the directions underneath the map. It will allow you to zoom in and get up close, often up to street level, to examine the location you have selected. You can select different views of the map such as a terrain map, street map, 3D earth map or road map by simply clicking on one of the buttons in the right hand top corner of the map. Below is a list of all the countries of the African continent. Clicking on anyone of them, will give you access to an interactive map of that particular country. The African continent comprises a vast rolling plateau, extending from the Atlas Mountains to the Cape of Good Hope. Just 10 percent of Africa’s land area lies at less than 500 ft above sea level, compared with 54 percent of Europe and 25 percent of North America. Only in the extreme south and north have great folded mountain ranges been build up. Elsewhere in the continent differences in elevation have been caused either by the faulting which produced the Rift Valley, or by the creation of the enormous river basins, notably those of the Congo, the Niger, the Nile, the Volta and the Zambezi, which are prominent features of the geography of Africa. At its periphery the plateau gives way via steep escarpments to the narrow coastal plain that surrounds the continent. All the great rivers of Africa, except the Niger-Benue and the Zambezi-Shire systems, plunge in falls or rapids over the escarpments, making effective navigation inland from the sea impossible. The map of Africa would not be complete without some interesting facts and figures that are part of the geography of Africa. Largest country,...The largest country in Africa is the Republic of Sudan. Sudan covers a total land area of 2,505,800 square kilometers (967,490 square miles). Smallest country,...The Seychelles, the smallest country in Africa. It is an island state with a total surface area of 453 square kilometers. The smallest African state on the mainland is Gambia, which covers a surface area of 11,300 square kilometers (4,363 square miles). Largest city,...The largest city in Africa is Cairo, the capital of Egypt, with a population of approximately 9,2 million people. Highest point,...With a height of 5,963 meters, (19, 349 feet) the Mount Kilimanjaro with its permanently snow capped summit is the highest mountain in Africa, situated in Tanzania. Lowest point....The lowest point in Africa is Lake 'Asal at 153 m (502 ft) below sea level in Djibouti. 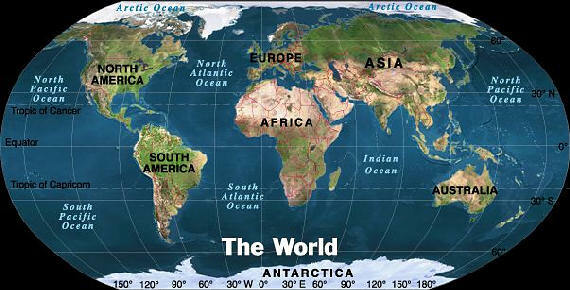 Northernmost tip....The northernmost tip of the continent is Cape Blanc in Tunisia. Southernmost tip....The southernmost tip of Africa is Cape Agulhas, situated in the republic South Africa. Largest lake....The largest lake on the African continent is Lake Victoria, situated 1,130 meters ( 3,720 feet) above sea level and with a surface area of 69,490 square kilometers ( 26,830 square miles). Its greatest known depth is 82 meters (270 feet). Lake Victoria forms the boundary between Tanzania, Uganda and Kenya. Deepest lake....With a maximum depth of 1,436 meters (4,610 feet) Lake Tanganyika is the deepest lake on the African continent and second deepest world-wide. Longest river....The Nile river, which runs through the length of the continent, is at 6,650 kilometers (4,132 miles) by far the longest river on the African continent and also the longest in the world. The Nile is a confluence of the White Nile which rises at Lake Victoria along with the Blue Nile which rises in Ethiopia at Lake Tana. The Great Rift Valley in Africa....The Rift Valley is more than 4,830 kilometers (3,000 miles) long and stretches between Syria in the Middle East and Mozambique in the southern part of Africa. The breadth of the valley ranges from a few km to over 160 kilometers (100 miles). In the eastern part of the continent the valley branches into two, the Western Rift and the Eastern Rift. The geological earth surface fracture in which the Rift is located is unstable and shifts from time to time. Lake Malawi....The lake with the largest variety of fish species anywhere in the world, is Lake Malawi. It is estimated at over 500 species from ten categories or families,... including 30% of all known cichlid species. Namib desert....The oldest desert on the African continent and the only one that is home to populations of Lion, Giraffe, Rhino and Elephant among others, is the Namib desert. Fish River Canyon in Namibia....With a depth of 550 m and a length of approximately 160 km,... the Fish River Canyon in Namibia is the second largest canyon in the world,.... before the Grand Canyon in America. Sahara Desert....The Sahara is the world's second largest desert,... second to Antarctica. It covers 9,000,000 sq km (3,500,000 sq miles),... and is 2.5 million years old.